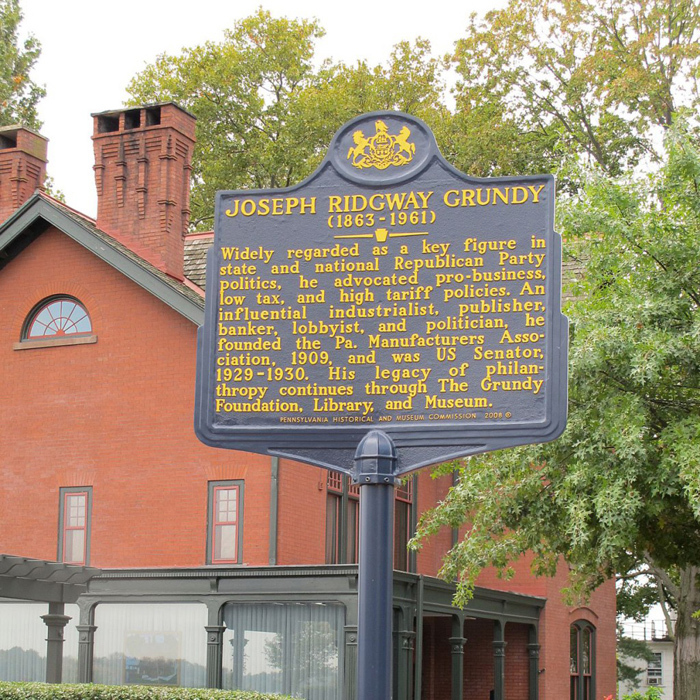 This historic marker, commemorating the life and legacy of Senator Joseph Grundy, was approved by the Pennsylvania Historical and Museum Commission. It was installed between two of the major parts of the Senator’s lasting legacy to Bristol—the museum and the library which were founded through his Last Will & Testament. Joseph Ridgway Grundy was born on January 13, 1863 in Camden, New Jersey, the son of William Hulme Grundy and Mary Lamb Ridgway. Shortly thereafter, the family moved to Bristol, where his father and uncle opened a woolen mill. The former mill building still stands near the Delaware Canal at Jefferson and Prospect Streets. Its clock tower has become an icon of Bristol and is visible from miles around. Upon William’s death in 1893, his son Joseph, only 30 at the time, took control of his family’s mill and broadened his investments and involvement in the region. He was on Bristol Borough town council for almost three decades, became president of the Farmers National Bank of Bucks County, and owned and published three regional newspapers: The Bristol Courier (now the Bucks County Courier Times), the Newtown Enterprise, and The Intelligencer in Doylestown. During his lifetime, Joseph Grundy supported many local improvements in the Borough of Bristol with gifts of both money and property. These gifts included financing for a public waterworks, a sewer system, schools, a post office, the municipal building and firehouse, playgrounds, and athletic fields. He was appointed to the United States Senate in 1929, but his heart remained with his beloved hometown. Upon his death in 1961, he established the Grundy Foundation, which still supports the Margaret R. Grundy Memorial Museum and the Margret R. Grundy Memorial Library–both named in honor of his maiden sister. Through grantmaking, the Grundy Foundation continues to improve the quality of life for the residents of the Borough as well as people throughout Bucks County.